During our stay in Ft. Lauderdale, we stayed at the Westin Resort on A1A. We were kindly greeted by valet service and a bellman who helped us with our luggage. Check in was relatively quick and easy. We were even upgraded to a partial ocean view room, despite not even asking for one. The Westin Ft. Lauderdale Beach Resort is actually two hotel towers with a catwalk on the mezzanine level which connects to the two buildings. The main building has the lobby, valet parking, American Vintage Restaurant, pool, and Waves (the pool grill and bar). The second building has the convention center, plenty of conference/ball rooms, gym, spa, and Starbucks. The hotel offers room service, which we did not use do to the high prices. 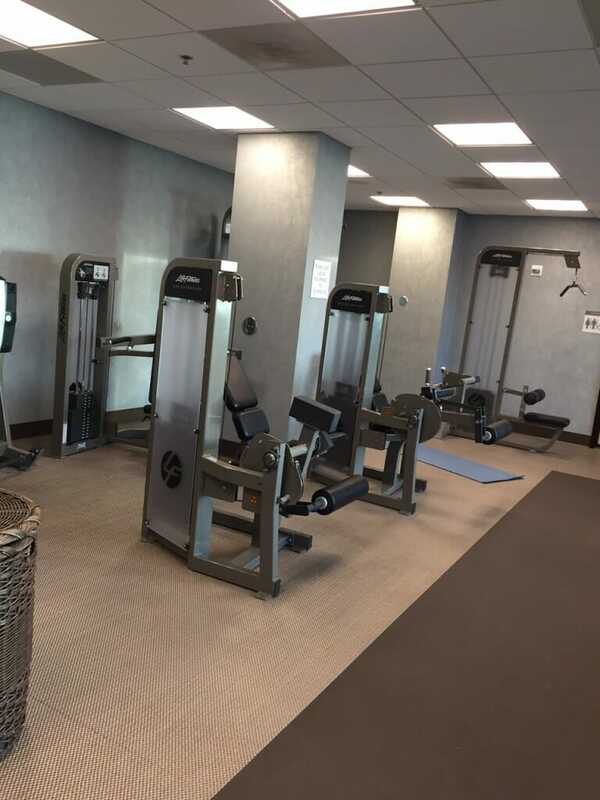 We also didn’t use the spa, but we did use their fitness center. 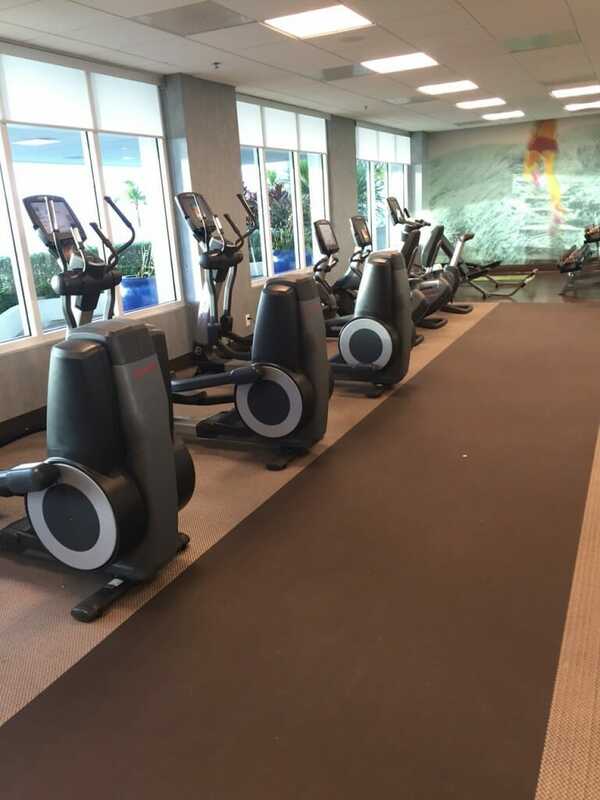 The Westin fitness center had a small free weight area, stability balls, exercise bicycles (upright and recumbent), elliptical machines, treadmills, a handful of machines, a lat pull down machine, and a large cable machine. All of the equipment seemed new and in great condition. The Westin offers clean towels, headphones, equipment cleaning wipes, and cold water. In addition to the nice cool temperature in the room, their gym had an awesome view of the beach. Watching a beach sunrise while working out can’t be beat for this midwestern girl! The overall decor of the hotel is modern yet comfortable. Upon entering the lobby, you’re met with dim lighting, plenty of seating, and a large pitcher of citrus water. The elevators were excellent. I’ve been in plenty of hotels where you spend a lot of time waiting to get an elevator, which dampens moods. There were only 3 elevators but I never waited more than a few seconds to get one. I was impressed! Our room was nicely decorated, yet felt a bit small. We had two double beds which was hard to get used to. Despite my husband and I being average sized, it was a little cozy to sleep in a double bed for my taste. Even a queen sized bed would have been better. 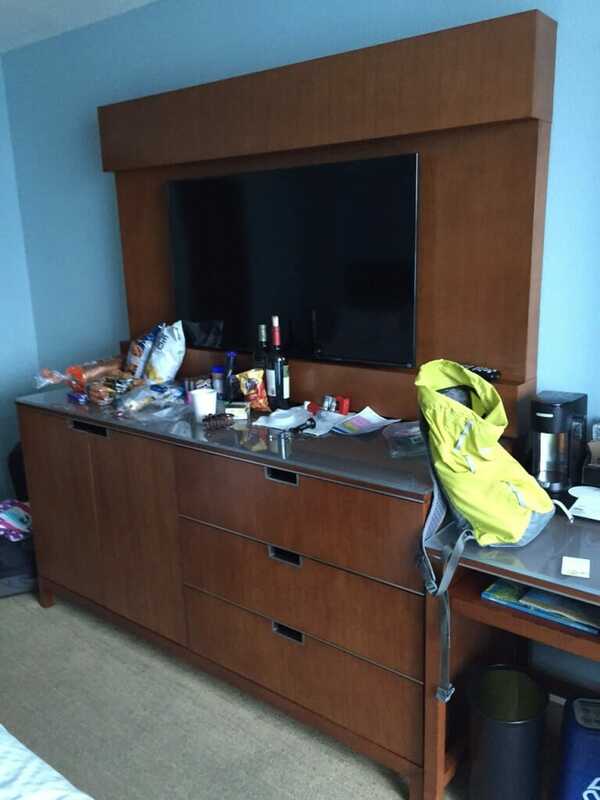 The room had a refrigerator, wine glasses and bottle opener, and Starbucks coffee. No rooms have balconies, but rather a sliding door that opens to get fresh air. There’s plenty of counter space within the room, but I could have used more in the bathroom. Also, whenever you are at a beach hotel, you can never have too many hooks or places to hang up wet bathing suits and towels. A few extra hooks in the bathroom or elsewhere in the room would have been nice. 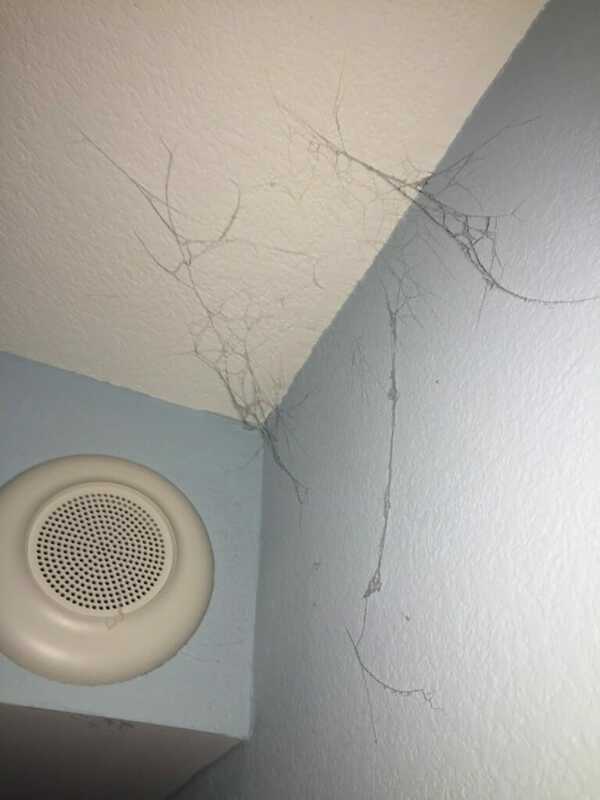 Our room was clean other than this cobweb my daughter found as soon as we checked into our room. The bathroom itself was nice and modern. However, the door to it was a sliding louvered door. There was also a louvered window panel into the bathroom as well. Having this plantation style look was nice for the decor but POOR for privacy issues. There was no lock on the door or window either so rules had to be given to my kids that a closed door or window means privacy. Definitely not a good design. Housekeeping was on the slow side. 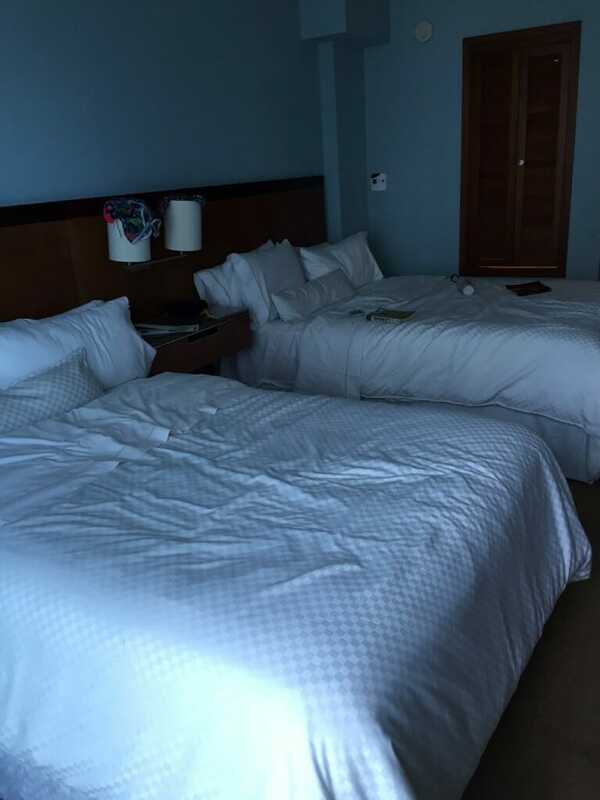 We’d spend all day at the beach or pool and come up to the room around 4:00 to shower and get ready for the evening, and twice housekeeping had not been in yet. This obviously became a challenge us, trying to time our schedule with when housekeeping finally reached our room. One day I had to ask housekeeping to clean our room ASAP while we stepped out. This was at 5:00pm. Despite our toilet issues, slower maintenance service, and the slow housekeeping, we had no other issues with the Westin’s service. They even called our room a few times to make sure our problems had been resolved adequately. The Westin offers free wifi to all SPG members that book on Starwood websites, so we didn’t pay for wifi. However, it seemed that if your connection was idle for awhile, it disconnected. So it was a little irritating that we had to keep logging in periodically through the day. The pool at the Westin was great. It’s a heated outdoor pool, but there is no hot tub. Towels are checked out to your room and need to be returned, or you pay a fee. 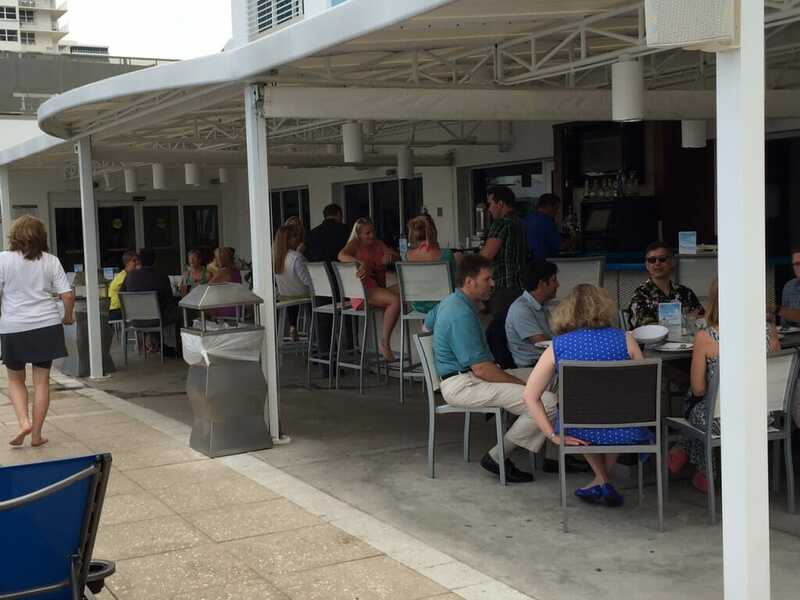 Waves is a poolside bar and grill with outside and inside seating (however service seems minimal inside). We never did eat there because I was not pleased with their limited vegetarian options. There are lots of pool chairs, but fewer umbrellas. There are a few cabana-looking areas on the pool deck but those are actually Lanai guest rooms that have “patios,” with chairs and tables on the pool deck. The pool was clean, warm, and refreshing. 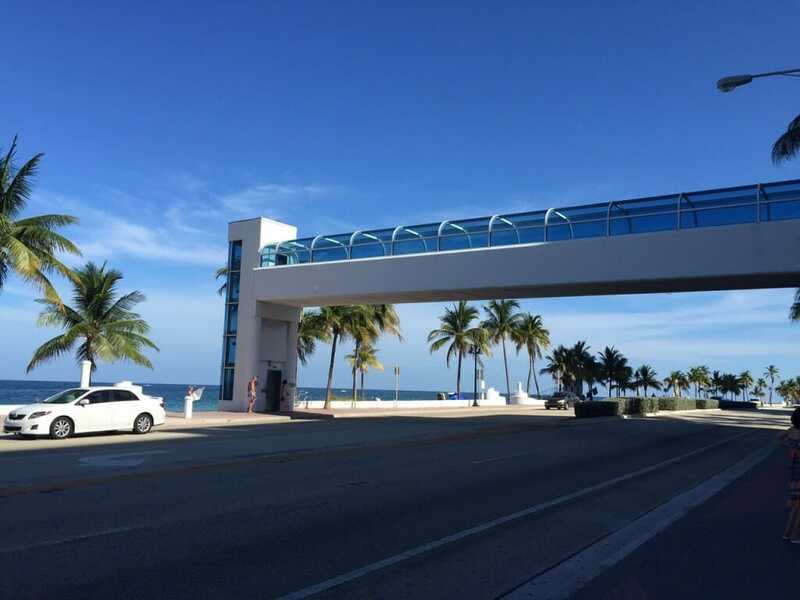 In addition, the Westin has a nice walkway over A1A to walk straight onto the beach. The elevators are a bit stuffy but you’re only in them for 15 seconds. The pool has an outside shower so that when you return from the beach, you can rinse off before jumping in. Music plays on the pool deck and occasionally wait staff from the poolside grill and bar will walk by to see if you need service. The friendliness of most of the staff stood out for me during my visit. About 90% of the staff was super nice and helpful. Staff members would just say “Hello,” and “Enjoy your day,” when you passed them in the halls. From the valets, bellmen, lobby staff, restaurant staff, maintenance, and even the people working the towel desk at the pool, I was impressed with their politeness and helpfulness. I almost gave the staff score an A, but a few mediocre employees brought down my score. 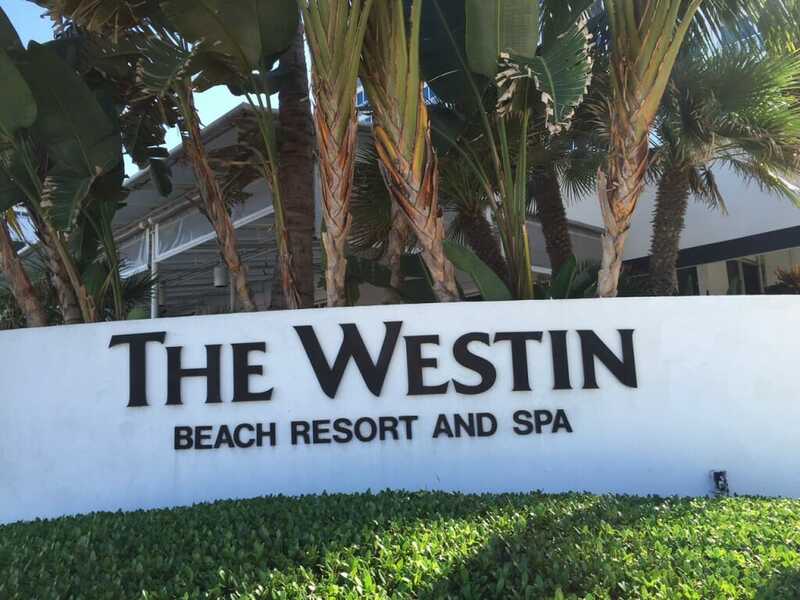 Despite our issues with our bathroom and housekeeping, we did enjoy our stay at the Westin Beach Resort and Spa in Ft. Lauderdale. 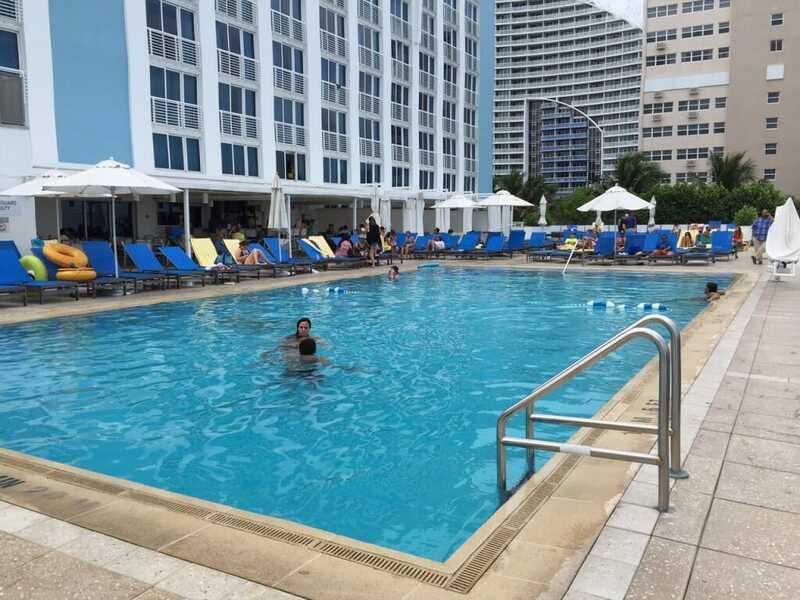 Their superior staff, comfortable lodging, and nice amenities made our vacation in Ft. Lauderdale a great one.